The growing wearables market has coincided with a major increase in the Health & Fitness app category; both hardware and software companies are engaged in a high-stakes race to dominate the digital fitness space. With so many players vying for market share, some brands are thriving (Peloton, Aaptiv) while others have disappeared altogether (Jawbone, Pebble). The primary difference between winners and losers in digital fitness? Customer experience. At Feed.fm, we provide integrated music content for many of the companies working in this space, including Fitbit, DailyBurn, and others. We’ve seen loads of fitness coaching apps that feature great instructors, thoughtful programs, and elegant user design. To succeed in today’s saturated digital fitness market, brands must differentiate themselves in other ways that deliver an exceptional customer experience. In our experience, music integration is one of the most effective techniques for achieving sustained user app engagement. Our data shows that music listening users outperform the average user across all core engagement KPIs (4x more time spent onsite, 2.2x more likely to return the next month, 3x more likely to return in a quarter). Newly invented transistor radios became popular in the 1960s and 1970s. While conveniently pocket sized, radio stations frequently cut in and out and consumers had just one earphone for listening. In 1979, Sony introduced the Walkman portable audio cassette player. Anyone alive in the early-80s remembers that the Walkman was a game-changer…Here’s a lovingly detailed, highly personal history of the Walkman. It wasn’t long before runners and other fitness enthusiasts adopted the Walkman as an essential component of their exercise programs. With the arrival of compact discs three years later, many Americans swapped their Walkman for the Discman. Compact discs captured a more pristine sound than cassette tapes and allowed listeners to easily jump from track to track. However, CDs weren’t designed for portable listening and the earliest Discman had a uniquely frustrating playback error of skipping when jostled or played sideways. In 2001, Apple capitalized on new MP3 file sharing software by inventing the iPod. Steve Jobs’ revolutionary concept? 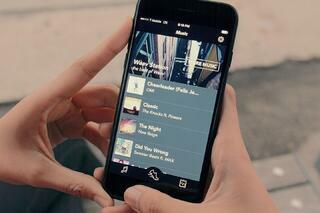 Imagine you could have 1,000 songs in your pocket. Music streaming services including Pandora and Spotify launched in the 2000s. Ironically, the launch of Apple’s iPhone in 2007 provided a portable music streaming option, allowing these companies to directly compete with the iPod for listeners. The playlist-based format of music streaming was ideally suited for fitness…these days it’s possible to find custom-created playlists for virtually every type of exercise. In just half a century the inconceivable has become a reality. Technology has advanced to the point where we can carry virtually all the music that’s ever been recorded in our pocket. In a world of unlimited, on-the-go access, it’s a given that most consumers want to listen to inspiring music when exercising. From the highly efficient iPod Shuffle to newer gadgets, the online journal Verywell spotlights 9 of the best music players for exercisers. And if you’re a tech geek/runner, TechRadar’s first pick for best wearables of CES 2018 may be up your alley: the Garmin Forerunner 645 Music. 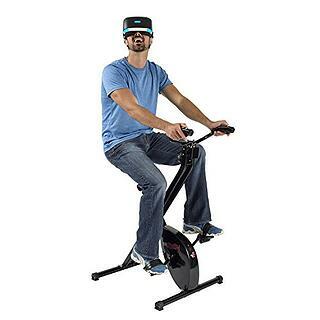 Virtual reality companies are also entering the digital fitness space. Is the idea of working out less appealing than playing your favorite video game? No problem. VirZOOM has created a virtual reality bike with game controllers built into the hands and headset, allowing you to physically power your choice of racecar, battle tank, or flying Pegasus. Even gamers need a good soundtrack to motivate their best performance, and VirZOOM users can choose between Feed.fm-curated playlists of High Energy Pop, Classic Pop, and EDM while exercising. From VR to wearables to older-school portable music devices, there are an incredible variety of options for pairing fitness and music. If you’re working in the digital fitness space and don’t currently provide music to your users, perhaps music integration should be one of your company’s New Year’s resolutions. For the rest of us, there’s still time to make or honor the personal resolution to exercise more regularly. it’s never been easier to take your favorite fitness program and music with you anywhere.